Paint It Black is another classic rock song by The Rolling Stones, one that you absolutely need to learn if you are into rock music. You'll learn a wide array of more advanced guitar techniques with this song, so if you are a beginner, this tutorial may be just a bit too hard for you. 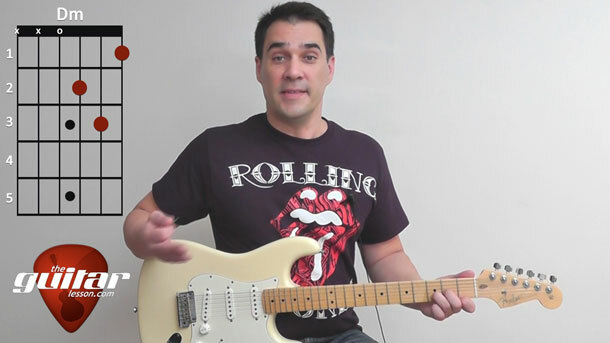 Our guitar lesson on Paint It Black will teach you how to play the entire song. There are several parts to it, so make sure you download the song's tablature file as well, it'll make practicing much easier. Once you are comfortable with everything, make sure you play along with the backing track to Paint It Black, you will be able to download it after loging in. The song was written in the key of E minor. To play it in this key, you would need to place a capo at the 2nd fret. We'll be learning Paint It Black in the key of D minor though, which simply means you don't need to put a capo on your guitar. All the chords and shapes will be the same if you decide to play it in key with a capo though. We'll start out by learning the famous intro riff. We'll play a melody line, and also add a constant drone in between most of the notes. This is what makes this song a bit tricky, always having to pluck the drone in between melody notes. But this is also why this song is so useful, it'll really advance your string skipping skills. Make sure to use alternate plucking through this section of the song. Next, we'll learn the verse, which is very similar to the intro, but we'll be using a different drone note. I know I know, reading about it doesn't make much sense, but you'll understand everything after you watch the lesson. After the verse, we'll move on to the chorus, where things will get a bit different. We'll be strumming chords in a way which is very characteristic to Paint It Black. This strumming rhythm will return in other places throughout the song, so make sure you learn it well. The initial 4 chords will be easy, but the muted strums will take more practice. Slow down, get those muted strums as precise as possible, and speed up once you can. The same goes for the outro. It'll have a similar strumming pattern as the verse, but this time, you'll also have to mute the A major open chord. I'll show you how to do that in the video. It takes some getting used to, but with enough practice, you'll be playing it as naturally as any other strumming technique you already know. Paint It Black was released by The Rolling Stones in 1966, on the US version of their album, Aftermath. The lyrics were written by Mick Jagger, and the music by Keith Richards. The song was a world wide hit, reaching the top of the charts in both the US and UK. The song was reissued in 1990 and 2007, meaning it had 3 sales cycles. A very successful song financially for the Stones. The main riff of the song is actually played on a sitar, not a guitar. Nevertheless, our lesson is a good guitar cover. Sorry, but you've reached a premium content area. The download of the Paint It Black tablature file is only available to premium members. Sorry, the same goes for the backing track. To download the backing track to Paint It Black, please log in and revisit this page.